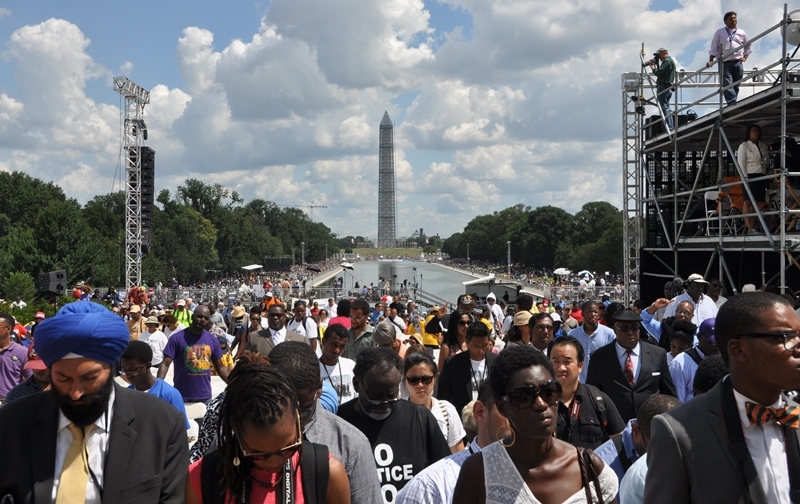 On August 24, a sea of people packed around the Reflecting Pool at the Lincoln Memorial to commemorate the 50th anniversary of the March on Washington where Dr. Martin Luther King, Jr. gave his historic “I Have a Dream” speech. The “Dream” has not been realized, but not been forgotten. 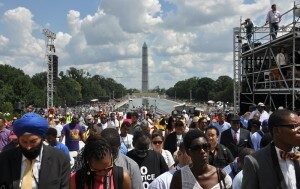 More than 200,000 people came to this March for Jobs and Freedom. They listened to the speeches by civil rights icons and others, renewing their commitments to continue the struggle. See photos of the March here. REP. JOHN LEWIS: My brothers and sisters, we cannot give up. We cannot give out. We cannot give in. We must get out there and push and pull…almost 50 years ago, I gave a little blood on that bridge in Selma, Alabama, for the right to vote. I am not going to stand by and let the Supreme Court take the right to vote away from us. REV. JESSE JACKSON: He [MLK] would have felt acutely the pain of stagnation, retrogression, unnecessary wars, drones, and the neglect of the poor, for there is too much poverty and hate and war. He was tormented by poverty, and using war and violence as remedies was unacceptable. His mission was to disturb the comfortable and comfort the disturbed, determined to remain permanently maladjusted ’til all of God’s children have the meal for their bodies and education for their minds and the health for their infirmities. JULIAN BOND: But still we march. We march because Trayvon Martin has joined Emmett Till in the pantheon of young black martyrs. We march because the United States Supreme Court has eviscerated the Voting Rights Act, for which we fought and died. We march because every economic indicator shows gaping white-black disparities. We march for freedom from white supremacy. But still we have work to do. None of it is easy, but we have never wished our way to freedom; instead, we have always worked our way. REV. AL SHARPTON: Don’t act like whatever you achieved, you achieved because you were that smart. You got there because some unlettered grandmas, who never saw an inside of a college campus, put their bodies on the line in Alabama and Mississippi and sponsored you up here…We need jobs. And if we can’t get jobs, we need to continue these marches. And if we get tired, we need to sit down in the offices of some of those here that don’t understand folk want to work and earn for their families. MARTIN LUTHER KING III: This is not the time for a nostalgic commemoration, nor is this the time for self-congratulatory celebration. The task is not done. The journey is not complete. We can and we must do more. The vision preached by my father a half-century ago was that his four little children would one day live in a nation where they would not be judged by the color of their skin, but by the content of their character. However, sadly, the tears of Trayvon Martin’s mother and father remind us that, far too frequently, the color of one’s skin remains a license to profile, to arrest, and to even murder with no regard for the content of one’s character. Regressive “Stand Your Ground” laws must be repealed. Federal anti-profiling legislation must be enacted. I am trying to find information about my great uncle, Ray Jackson Jr. from Syracuse, Kansas. My Uncle Ray joined the LIncoln Brigade and was killed in Gandesa , Spain on April 1 or 2, 1938. I would very much appreciate if you have any information about him.